I was thrilled to be invited to Gunnedah and Tamworth schools for a week, so I decided to catch the train to Gunnedah. It was over seven hours so I planned to read Jesse Blackadder’s book, Chasing the Light. But, the tracks were being repaired so I climbed on a coach and three hours later, the train. 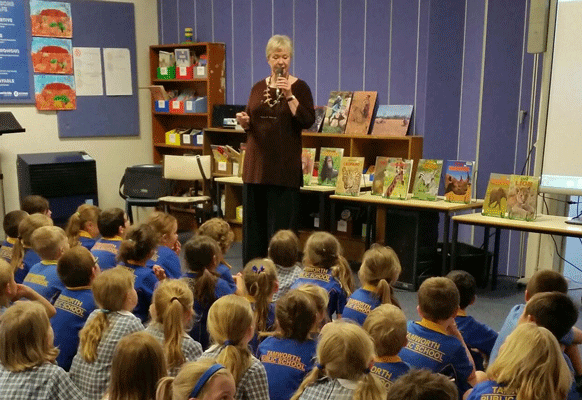 Kristy Hudson, the teacher librarian at Gunnedah South Public School gave me a great welcome to the school and told me the children were so excited about my visit. For three days I talked about my adventures in the wild, endangered animals and we had a fun creative workshop “Safari Adventures”. Kristie also organised a drawing competition and it was a difficult task choosing the winners from each group. One day I went to see the resident koala at the school. The children said the koalas often came down from the trees, ran across the grass and scuttled up another tree. Such lucky children! 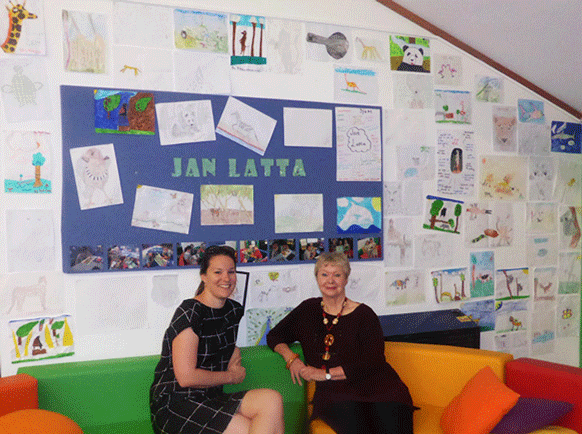 Kristie kindly drove me to Tamworth Public School where Lindy Kurtz, the teacher librarian, organised Year 1 and Year 2 in a special room to hear me talk. The Principal was my hero getting the speaker and microphone to work and children asked amazing questions. It was a great day. After school Lindy invited me for a coffee in the most beautiful garden. It was a wonderful and relaxing way to finish the week. Next → Next post: DISASTER!! !